Try Gastric Band Hypnosis in Bournemouth For Effective Weight Loss. The hypnotic gastric band has been widely publicised of late, having featured in a number of national TV series. Dolphin Hypnotherapy is a licensed Hypno-Band practioner, trained to use hypnotherapy gastric band techniques to help those serious about weight loss to lose the pounds without the risk of surgery. The Hypno-Band technique is the number one virtual gastric band system in the world and is the original method in the United Kingdom. Hypno-Band is a registered trademark and has over 540 licensed practitioners in 25 countries. Beware of imitations. The hypnotherapy gastric band method utilises a combination of hypnosis and cognitive behavioural therapy (the psycho-therapeutic intervention of choice in the NHS) and is a safe, risk free and far less expensive option than actual gastric band surgery. This unique and effective combination of treatments will help you change your eating habits forever, not just for the short term, thereby avoiding the yoyo effect. The method is appropriate for those with a BMI over 30 (25 in some cases). If you are really committed to losing weight then a hypnotherapy gastric band will help you to achieve your goals. During the hypnotic gastric band program you will explore, analyse and change your eating habits, and your very powerful subconscious mind will act as if you really had had gastric band surgery. As a result you will feel less hungry and eat less often until your goals are achieved. The gastric band hypnotherapy program in Bournemouth is a series of one hour consultations plus mp3 recordings for you to use in between. A detailed dietary and medical history will be taken during the initial consultation and a full explanation of hypnosis provided. In the second consultation you will experience hypnosis first hand and in the third consultation the hypnotic gastric band will be fitted. In the fourth and any further consultations the band will be adjusted and the process reinforced. Following the sessions you should use the mp3 recordings to reinforce the work done. The hypno-band hypnotherapy system is relaxing, pleasurable and effective, furthermore there are no unpleasant side effects. Whilst gastric band hypnosis is a very powerful method, there can be no definite guarantees, no more than there can be in any medical or therapy procedure. Even actual gastric band surgery is not guaranteed. They key to success is you! No diet or weight loss system in the world will work unless you are committed to losing weight. You must be willing to change your lifestyle and habits for good. A hypnotherapy gastric band will give you the tools and ability to achieve your goals but only you can put them to use. Think of the following analogy, if you go to your GP for some pain killers and he gives you a prescription, if you collect the tablets but don’t take them, they wont work! Why Choose Dolphin Hypnotherapy for Gastric Band Hypnosis in Bournemouth? Dolphin Hypnotherapy offers gastric band hypnosis in Bournemouth, carried out exclusively by a licensed Hypno-Band practioner. There are fewer than 600 recognised, licensed practioners in the world, making Dolphin Hypnotherapy a reliable, reputable and trusted partner for your weight control needs. Using a licensed practioner is the only way you can be certain you’re receiving the best possible hypnotic gastric band treatment. 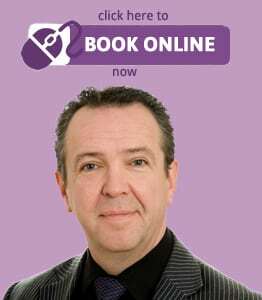 Our Senior Consultant and hypnotherapist Mr. Roberts, is also highly experienced in Psychology, Psychoanalysis, Psychotherapy, counselling and cognitive behavioural therapy (CBT). Using his experience successfully treating hundreds of patients to overcome their fears, gain confidence and beat anxiety and phobias, we introduce the hypnotic gastric band over a number of one hour sessions, providing full explanation and support at each stage of the process. MP3 files are also available to use at home, the office or while travelling for your complete peace of mind. The cost of the full treatment program (four consultations plus reinforcement CDs, charts and handouts) is £295 inclusive. For further information, help and advice contact your licensed Hypn-Band practitioner at Dolphin Hypnotherapy today.